Wow…what an incredible day! No cars, no clouds, hot and sunny, and a beach on an island. Does it get any better? Yesterday we decided to make a new play date with one of Miss G’s classmates, Bia. They are like two peas in a pod and are so cute together! We, along with Bia’s parents, Carlos and Rita, planned a play date on the beaches at Ile Sainte-Marguerite; famous for where the Man in the Iron Mask was imprisoned and where the Hollywood movie was partially filmed. “The Île Sainte-Marguerite is the largest of the Lérins Islands, about half a mile off shore from the French Riviera town of Cannes. The island is approximately 3 km in length (East to West) and 900m across. 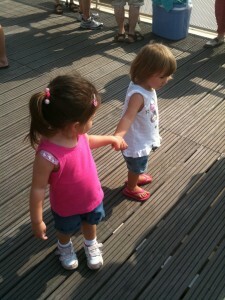 G & Bia holding hands and waiting for the ferry to Ile Sainte-Marguerite. While this trip wasn’t about touring Fort Royal (for another day), it was about languishing in the sun, enjoying a bottle or two of rosé wine, and great conversation with Carlos & Rita, who recently relocated to the Cote d’Azur from Portugal. Like us, they are enjoying the area and weather in the French Riviera and we all have so many things in common. It’s so great to meet new friends that are in the same place as ourselves; new parents, new country to live, etc. We have met so many fabulous people in the past year from all over the world. We are so blessed! The Cote d’Azur is an amazing place to live and such a great opportunity for the kids! We are glad that Miss G has become great friends with Bia and now has yet another close friend to enjoy planned outings with. 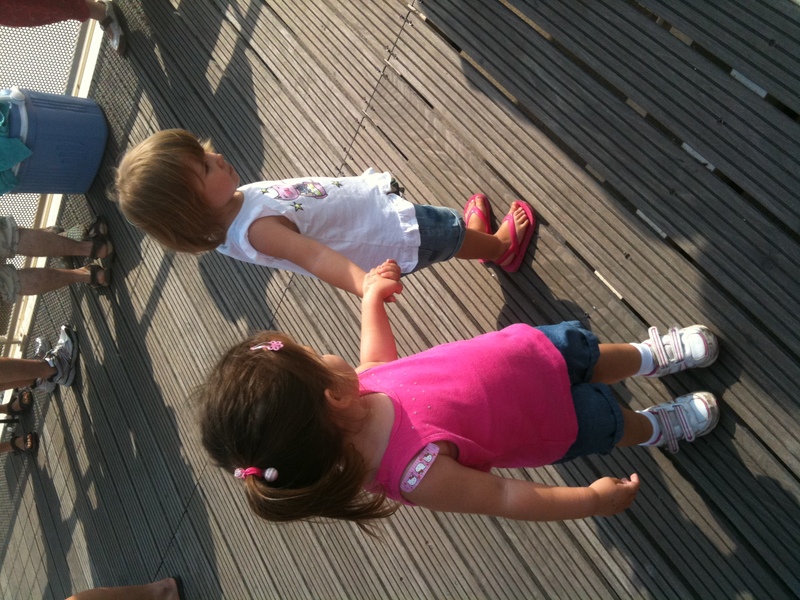 G and Bia walked hand-in-hand pretty much the entire way from the ferry to the beach! They get along so well and it’s so cute to see them having a conversation amongst themselves playing in the sand and floating with their water-wings in the water. Now, I think we just have to get all our other “France” friends together and have a “grande” time on the beach one day this summer! Hmmm, maybe a beach picnic is in store soon. 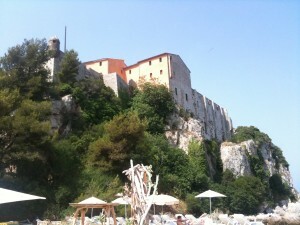 Here are some pics from our day on Ile Sainte-Marguerite! As always, click the pic below to enjoy the slideshow! Fort Royal on Ile Sainte-Marguerite.